Timing The Market – Time To Step Aside? There is no shortage of strongly held opinions about timing the market. Broadly speaking, market timing is identifying the climate of the market as it cycles between favorable and unfavorable. Is it favorable (bull market) to investing or adverse (bear market)? In some respects, it is like dressing appropriately based on weather conditions. We want to invest appropriately for market conditions. Everyone times the market. Some people buy when they have money, and sell when they need money, while others use methods that are more sophisticated. Market timing was characterized by Charles Dow as tides (primary waves), waves (secondary waves) and ripples in the market. The point is that timers with a long time frame try to identify tides in the market - i.e., the market climate. Timers with a shorter time frame try to identify the waves and those with a very short time frame try to identify the ripples. This discussion is focused on market climate. NOTE: Market direction is important. Going with the flow of the market according to IBD (Investors Business Daily), accounts for 65% to 75% of the success of a trade. You do not want to be swimming against the tide if possible. Most of us do not deal well with significant losses of our money. If you were able to observe the panic of the newly retired in 2000 and 2001, and again in 2008, you probably witnessed the emotional effect of having a nest egg take a big hit. Not detecting the change from unfavorable to favorable is a lost opportunity. As retail investors, we have the ability to react if we can detect the change. A huge advantage for retail investors is size - small compared to institutional and commercial investors. Large scale investors simply cannot make rapid changes in their portfolio without further significant impact to the market. They have options, but reacting quickly to market conditions is not one of them. 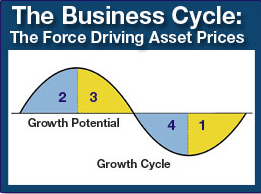 The business cycle graphic used by George Dagnino illustrates the relationship of business to the stock market. The market should be favorable in phases 1 and 2 and unfavorable in phases 3 and 4. From a behavioral finance point of view, retail investors often behave badly. And that is their distinct disadvantage. Without a quantitative plan to manage their investments, it is not unusual to enter the stock market late in phase 2 and exit the market late in phase 3 or in phase 4. The intent of the following approaches to timing the market is illustrating how we, as retail investors, can reduce or eliminate subjective opinions of the market. These are long term views of the market. Tides, in Charles Dow's world. We need a repeatable, sustainable, manageable approach. And knowing whether the market is favorable or adverse, we can invest appropriately. NOTE: Most adverse US market periods correspond to US recessions. NOTE: Keep in mind that no system deals with unexpected events. Just as ocean tides are overwhelmed by a tsunami, the market can be overwhelmed by events. There is no guarantee you will avoid a disaster. Rotation - rotate to an asset, sector or industry less affected by current climate. Actually a specific application of technical analysis. Technical Analysis – use market pricing and volume to identify market conditions. Normally the only possible approach for ripples and waves. Economic Indicators – analysis of economic data with respect to the existence of a recession. Seasonal Cycles - assume market cycles correspond to climate cycles. Fundamental Analysis – use fundamental criteria applied to an entire market class, not just a company. Investor Sentiment - the feeling of the crowd about the market. This is not necessarily a correct interpretation of the market, but it is remarkably consistent. Abandon all hope and just suffer through. IBD feels the rotation of the sectors (i.e., identifying the sectors with the most strength) accounts for most of the remaining success in investing. Apart from hedging, rotation among assets is the only real timing option for institutional and commercial investors. However, they often insist they don't time the market. On one occasion, I attended an investing presentation where the speaker disavowed timing the market only to then describe how their firm moved from sector to sector based on an evaluation of the market. Hmmm. "The Ivy Portfolio", Mebane Faber's book about Ivy League endowment portfolios, details their asset class management and rotation approach. An excellent example of dealing with market adversity on a large scale. The book also describes how retail investors can use this approach. Using Portfolio Visualizer, the chart below shows the back-tested performance of the S&P 500 ETF, SPY, from 1995 through June 2018. The big differential is generated by avoiding the adverse markets of 2001 and 2008. However, like most technical approaches, there is a whipsaw in the 2015-2016 period. Using rotation, CAGR for the period improved from 9.87% to 11.75% for a total return improvement of about 50%. Drawdown was reduced from a max of 50.8% to 16.23%. Huge. Another rotation based tool is SectorSurfer (here for review). Their proprietary algorithms select a single "best" from a list of 12 ETFs or stocks. Below is the backtest of one of their free, pre-built strategies. 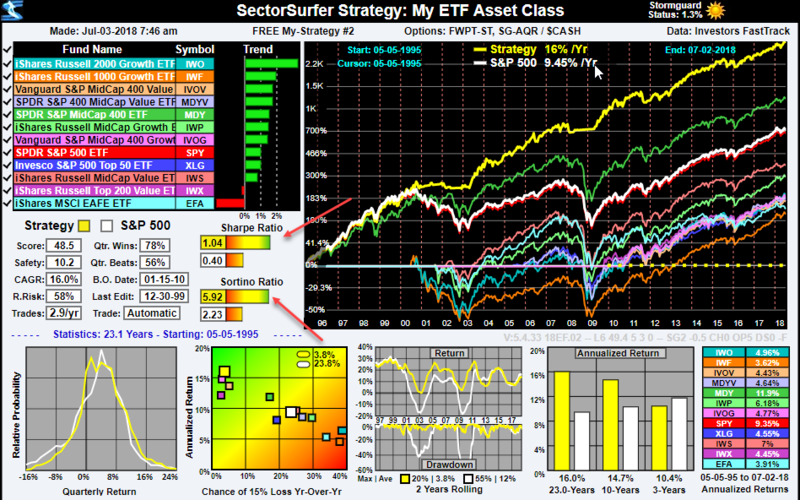 Like the Portfolio Visualizer results above, performance lagged the last 3 years. But, notice the Sharpe and Sortino ratios. Rotation reduced risk significantly. Technical analysis of price and volume is the common form of Dow Theory and probably forms the core of most market timing systems. If everything that can be known about the market is reflected through analysis of price and volume, then timing the market using market prices and volume can guide your investment decisions. This long term market timing system is based on an analysis of the monthly price action of the S&P 500 beginning in November 1957. If you prefer to use a long term system tied to daily or weekly price action, the traditional "golden cross" system may be for you. The detailed analysis is not included but a description of how you can study it for yourself is. It is easy enough to use one of the free TA screeners (e.g., bigcharts or stockcharts) to determine the condition of the market at end of each day. From a timing point of view, identifying the start of a recession can be a key to avoiding major financial losses. Downturns in the market often (not always) correlate with the start of a recession. There is a major problem, though. Recessions are only identified by economists in retrospect - i.e., after they are complete. The good news? Several economic indicators appear to consistently predict the onset of a recession. The yield curve is an economic indicator tracking the difference between the interest rates of short-term and long-term US treasury bonds. Normally the rate on the long-term bond is higher than the rate on the short-term bond. If not, the yield curve is said to be inverted. Historically, an inverted yield curve suggests that a recession will start 12 to 18 months down the road. Not always, but it is a valid caution sign. At the same time, understand there have been major market corrections (1987) when no recession was identified. Check here for a more complete discussion of yield curve and other economic indicators. When it comes to timing the market, the "best six months" system is a clear winner for ease of use. It is based on stock market cycles and ties in nicely with the Wall Street adage "sell in May and go away". If you have read Unexpected Returns by Ed Easterling, you are aware of the effect Market PE and interest rates have on market conditions. Portfolio123 has an interesting approach to timing the market using the EPS of the S&P 500 combined with a Fed risk model which has been very effective since March 2001. The normal view of market sentiment is that, at market extremes, the crowd gets it wrong. At the end of a favorable period, crowd euphoria may turn into a bubble. Bubbles burst; especially financial ones. Referring back to Dagnino's Business Cycle model, the crowd just doesn't believe that the market has transitioned to a phase 3. At the bottom of an adverse period, the opposite is true. Fear rules. Even as late as 2005, I had friends who didn't think the debacle of 2001 was over, and whose investments were sitting in cash. In the current politicized environment, listening to most market pundits is not necessarily an alternative. There is little wrong with using any of the apporaches to timing the market described. Each has some short-comings on its own but is better than ignorance of the market. Always, I examine the yield curve (10 year and 2 year maturities). If it inverts, caution is necessary. As of July 2nd, 2018, it is still positive, but dropping. Even if it does not invert, the market may become adverse, so do not become complacent. My approach is being updated to use a composite of technical, economic and fundamental indicators. From these signals, a composite score is created to determine market climate. Preliminary testing suggests that adverse conditions are detected at about the same time but whipsaws (false signals) are reduced. Re-entry to the market is improved. Use your preferred technical approach and combine it with signals from one or more of the other categories described above as your personal approach to timing the market.